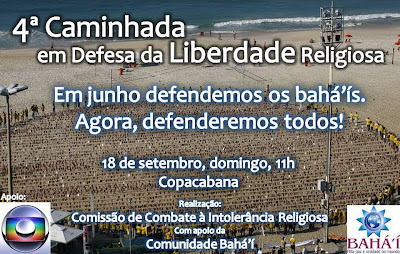 On the main street of Copacabana, Rio de Janeiro – one of the world's most famous beachfronts in the world – members of various religions will gather on September 18th to claim the right to freedom of belief during the 4th edition of the Religious Freedom Walk. Over 200,000 thousand people are expected to participate in the event, which has the support of TV Globo, the major television station in the country. The non-profit mobilization is organized by the Rio de Janeiro's Commission for Combating Religious Intolerance (CCIR). Its first edition was in 2008 and it has now become a traditional event in the Brazilian national calendar. The Commission is formed by Spiritualists, Jews, Catholics, Muslims, Malian, Baha'is, Evangelicals, Hare Krishnas, Buddhists, Gypsies, Wiccans, Agnostics and followers of Umbada and Candomble. The Court of Rio de Janeiro, the Brazilian Public Ministry and Civil Police are also members of the Commission. Since March 2008, when the religious Candomble1 and Umbanda2 joined efforts to denounce the advance of religious violence after acts of vandalism occurred in the city of Rio de Janeiro, more than 220,000 thousand people in total adhered to the walk on the streets of Copacabana calling for justice and religious freedom. These individuals represent the real possibility of having a peaceful coexistence between all religions. The mobilization around the Walk was the way found by the Carioca society to unite against acts of drug dealers that invaded sheds and threatened to kill Afro-Brazilian adherents unless they recanted their faith and converted to the Gospel. It also expressed their dissatisfaction with the fact that militia leaders were also involved in this kind of religious persecution. According to the official website of the Walk, the movement intends to involve an ever-greater number of people from all religious backgrounds to take a stand against all forms of intolerance, against prejudice and hate. In June 2011 Copacabana staged a smaller, but equally relevant, demonstration regarding the issues of religious freedom, intolerance and persecution. It was focused on the release of seven Bahá'í leaders who have been imprisoned in Iran since 2008 and were sentenced to 20 years of prison for their adherence to this faith. . On that occasion, almost 8.000 masks were laid in the sand, representing the sum of the number of days that these Bahá'ís had spent in prison thus far. They are accused of being spies for "enemy countries" and for conspiracy against the Regime – when in fact their only crime has been to work for the betterment of their own society, according to the teachings of their peaceful religion. Organized by the Brazilian Bahá'ís, whose official number today is of 65 thousand adherents in the country and over 7 million across the globe, the event attracted international attention and was featured by many international news agencies, such as AFP and Reuters.More information on this event and on the situation of the persecuted Bahá'ís can be found at www.bahai.org.br/noticias/liderancas_presas. Despite the freedom and wide acceptance that the Bahá'ís experience in Brazil and in most countries where they are established as religious communities, the situation of their brothers and sisters of faith in Iran is very different. According to Iradj Eghrari, a Carioca of Iranian origins, the situation in the birthplace of the Bahá'í Faith is dire and worsens at every minute. “The similarities of the persecution against the Bahá'ís in Iran and the Afro-Brazilian religions here are many: properties are destroyed and confiscated, children are harassed and youth cannot have access to education because of their beliefs”, says Eghrari. “And the only way in which the oppressors agree to leave these people alone is if they agree to recant their faith – but how can you forcefully remove a religious belief from a person without tearing him or her completely apart?”, he asks. While the different religions in Brazil apparently coexisted peacefully, there is still a systematic disregard to the rights of religious minorities. In particular, there is still much prejudice against the Afro-Brazilian religions, which leads to violent actions as the invasions of Candomble's and Umbanda's believers homes and worship places [known as Terreiros], conflicts in neighborhoods and schools, and disrespectful reactions against symbols of these traditions. “Prejudice, stereotypes and lack of information about the various religious traditions makes people behave irrationally against those who have different beliefs”, says Eghrari. “It is as if they stopped seeing these 'other people' as human beings, like people who deserve respect and fair treatment”, he adds. 1 Candomble is an African religion that was brought to Brazil through the flow of slavery. The diverse origins of the tribes, and the various regions of Brazil where implanted, giving rise to the various nations of Candomble, Ketu being considered as the most traditional one. 2 Umbanda is an Afro-Brazilian religion which derives from religious syncretism, incorporating elements of Catholicism, Kardecism, Buddhism, Islam and Candomble. It was founded in 1917 in the city of Niterói, in the state of Rio de Janeiro. For more information on the Religious Freedom Walk, please see www.eutenhofe.org.br.